Attending the Sunday afternoon (July 15, 2018) program in the Koussevitsky Music Shed at Tanglewood was no easy matter; every bit of it commanded your attention, from Mendelssohn’s beautifully familiar Italian symphony, through Yuja Wang’s dazzling performance of Beethoven’s 1st piano concerto, to the how-fit-in-these-fraught-times composition from the celebrated culture warrior Leonard Bernstein, Chichester Psalms. Besides being the summer of Lenny, another theme at Tanglewood has been brilliant pianists whose names rhyme. Yuja Wang (Lang Lang opening night) performed the Beethoven piano concerto with an ethereal artistry; I listened to a few minutes of the first movement with eyes closed and was startled upon opening them that people were responsible for the sounds I was hearing. Yuja Wang performs Beethovens Piano Concerto No. 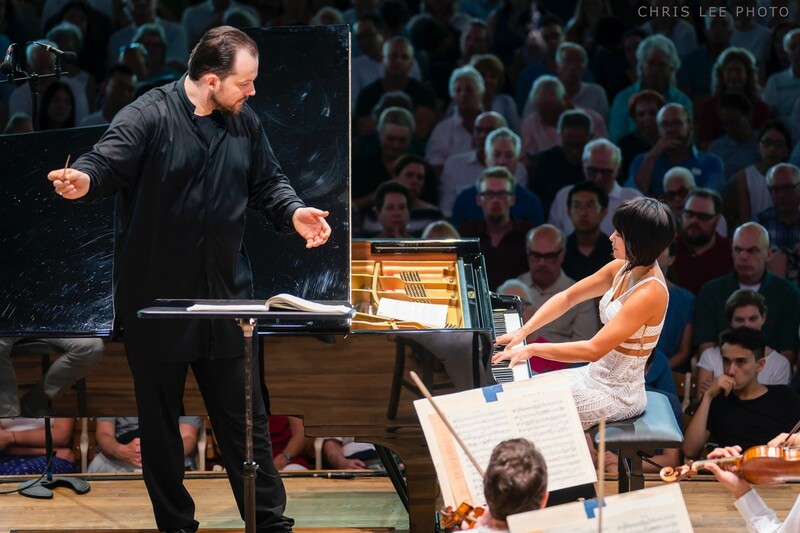 1 with Andris Nelsons leading the BSO at Tanglewood July 15, 2018; Chris Lee photo. An unfortunate ancillary matter accompanied Bernstein’s Chichester Psalms, the most awaited composition on the program. The Tanglewood Festival Chorus, the all-volunteer organization that became beloved under nearly fifty year leadership of founding director John Oliver is in upheaval. Since assuming leadership last year, James Burton has instituted practices that have insulted and angered TFC veterans. It is reminiscient of the furor at the Tanglewood Music Center that came about in the fourth decade of Seiji Ozawa’s overripe tenure running the whole operation. How many in the large audience were wondering his reaction to politics today, this artist who hosted a dinner party during the Nixon administration to raise money for the legal defense of several Black Panthers? The July 12 All-Bernstein program in Ozawa Hall at Tanglewood, selections from the Bernstein Songbook, followed by Trouble in Tahiti, was one of those events that require your attendance if you intend to get the most out of the local cultural scene. Leonard Bernstein was a member of the inaugural class of the Boston Symphony Orchestra‘s summer music school in 1940, now known as the Tanglewood Music Center. He was a protege of founder Serge Koussevitsky, became his conducting assisstant, and then rocketed to fame as assisstant conductor the New York Philharmonic Orchestra in 1943. He was the un-rehearsed last-minute replacement for Bruno Walter in a Carnegie Hall concert broadcast nationally that was praised on the front page of the next day’s New York Times. 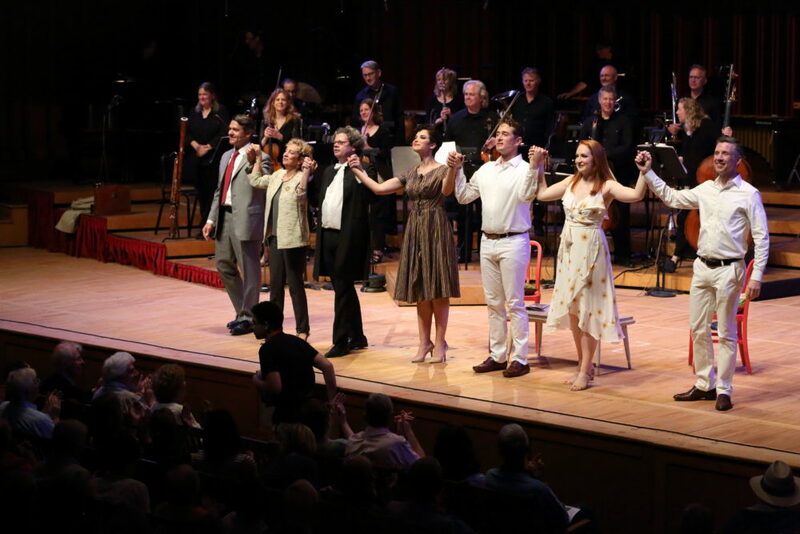 Leonard Bernstein’s Trouble in Tahiti, cast photo with director Jamie Bernstein, at Tanglewood; Hilary Scott photo. His final conducting performance, with the BSO in a program of Britten and Beethoven at Tanglewood on August 19, 1990 was celebrated in newspapers around the world in articles that mentioned the coughing fit he suffered in the midst of Beethoven’s Seventh Symphony. Diagnosed with emphysema in his fifties, he announced his retirement from conducting five days before his death Oct. 14, 1990. The celebrated and re-calibrated acoustics of Seiji Ozawa Hall, which commands the Leonard Bernstein Campus, may not be ideal for selections such as on this program; whereas the singers made good and pretty sounds, it could seem an effort to discern the semantics of various songs. Maestro Bernstien’s daughter Jamie was easily understood in her role introducing the Selections from the Bernstein Songbook, though, and her direction of Trouble in Tahiti was happily applauded.